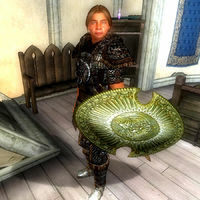 Pinarus is equipped with a leveled set of heavy armor consisting of the cuirass, greaves, gauntlets, shield, and boots. He is armed with a leveled longsword and carries a spare light armored shield with him. He also has a set of lower-class clothing consisting of a shirt with suspenders, breeches and a pair of rough leather shoes. He also carries his house key. During the related quest, he will break off his routine in order to lend you a hand in tracking down the mountain lions that have been terrorizing Arvena Thelas' pet rats. He will take you to a small grassy area surrounded by rocks, just northwest of the Horse Whisperer Stables. Once there, he will fight the lions alongside you, and afterwards, he will stay alert in the area until you complete the quest. During this stage, he will not offer any training. When you meet him for the first time, he will introduce himself and his passions in life: "Pinarus Inventius, hunter, woodsman, and marksman, at your service." When asked about Anvil he will go into details: "Plenty of deer, wolf, boar, mountain lion, bear in the county. Just need to know where to look for 'em." During the Fighters Guild quest, he will be quite surprised when you give him the facts: "Mountain lions? Here? Odd. If they're around, I can find them. Come with me. A hunt will do us good, and maybe make that old nut feel better." When you and him arrive at the spot, he will fill you in on the situation: "If they're out here, they'll be in this area. I can't imagine there are more than four of them. Let's take care of this." After the fight, he will ask you to seek out Arvena once again: "I think that'll be all of them. Can't imagine more in this area. You can go tell Arvena this is all taken care of. Good hunting." As an advanced trainer, Pinarus can provide you with the necessary reference for the Marksman Master Training quest. Once your marksman skill level reaches 70, speak to him, and choose the "training" option. If he responds with "You are very good with a bow. It's a shame I can't help you any more. If we were better friends, I might be able to give you one last piece of advice." then you will have to play the persuasion mini-game or bribe him to raise his disposition to 80 or more. After that, he will be more talkative and trigger the quest pointing you towards master trainer Alawen with the words: "There's only one last thing I can say about Marksman training. If you want to be the best, you have to learn from the best. And the best I've ever seen is an Archer named Alawen. Not sure where she is now; last I heard, she had a camp east of Anvil, out in the forest."